Medial Collateral Ligament (MCL) reconstruction replaces an injured or insufficient Medial Collateral Ligament, which runs from the thighbone (femur) to the shinbone (tibia). The ligament is most often injured by a sideways blow to the knee while the foot is planted. 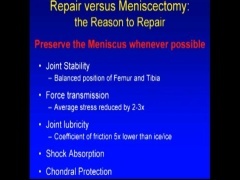 MCL injuries often coincide with injuries to the Anterior Cruciate Ligament (ACL) or meniscus. The doctor will perform various hands-on tests to determine the degree that the knee wobbles and the range of motion it allows, and to rule out other injuries that may require surgery. He or she may also order diagnostic x-rays, MRIs, and possibly blood or urine tests to check for possible abnormalities. Because the MCL’s long, fibrous cells are fed with plenty of blood, the wound will generally heal on its own. Depending on the severity of the injury, the doctor may order the patient to use crutches or wear a movement-restricting knee brace to protect the ligament while it heals. If the doctor decides that the MCL tear is too large to heal on its own, or is healing with too much laxity, he or she will discuss surgery, including different MCL graft possibilities, with the patient and gain consent. The patient is anesthetized and arthroscopy is performed to assess the condition of the MCL and prepare the inside of the knee. The knee is then bent to 30 degrees to provide the best angle possible for MCL reattachment.